In this Windows 10 guide, we'll walk you through the process of downloading and creating a bootable USB drive with the stand-alone version of Microsoft's free antivirus app, and we'll show you how to use it to clean up your computer from malicious and unwanted programs. When your Windows 10 PC gets a hard-to-remove virus, you can use Windows Defender Offline to get rid of it once and for all. It's happened to you, or to somebody you know. An annoying and dangerous virus or bit of malware has wormed its way onto your computer, and it is wreaking havoc. When these type of malicious codes install themselves on your computer, they can rapidly take control of your PC and cause irreversible damage. Even if you have an up-to-date antivirus running on your computer, sometimes these threats are very hard to find and remove, often masquerading as part of the operating system. For this reason, Microsoft offers Windows Defender Offline, which is a version of its antivirus that you can run from a USB drive to help you remove malicious code that is infecting Windows 10. Before proceeding with this guide, you will need external media, preferably a USB flash drive with at least 1GB of capacity, but you can also use a CD/DVD, or you can create an ISO image. This process will wipe and reformat the drive, so make sure you back up any content on if you want to keep to another location. Quick Tip: You will need to download the correct version of Windows Defender Offline for the computer you wish to scan. 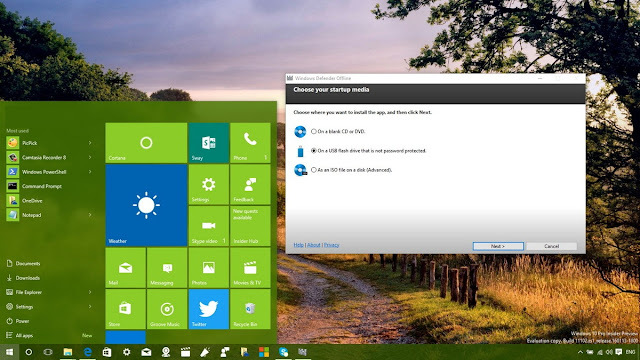 If you don't know which version of Windows 10 is running on your PC, you can easily check by using the Windows Key + I keyboard shortcut to open the Settings app, go to System > About, and you will find the version of Windows 10 under "System type". Once the download completes, double-click the mssstool32.exe or mssstool64.exe depending on your version. The Windows Defender Offline Tool wizard will open, and then click Next to continue. 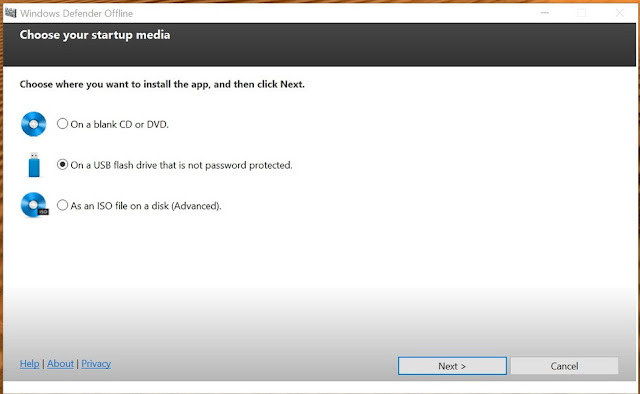 After accepting the license agreement, select the type of bootable media you want to create. For this guide, we'll choose the On a USB flash drive that is not password protected option, and click Next. If you have more than one USB storage device connected to your computer, you'll be given a drop-down menu to select the drive you want to use. Pick the drive you want to use and click Next. 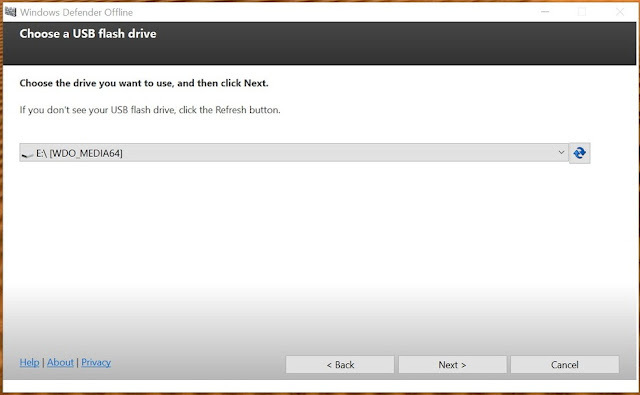 Click Next to confirm that the wizard will reformat the USB flash drive. Now the necessary files will download, and the wizard will complete creating the Windows Defender Offline bootable media. Then simply click Finish to close the wizard. 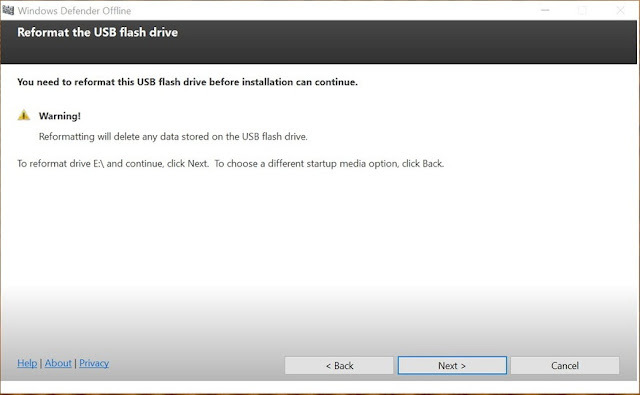 Before you can use the USB flash drive to perform a scan, you have to make sure your computer is configured to boot from removable media. Typically, this requires hitting the one of the keyboard's function keys (F1, F2, F3, F10, or F12), ESC, or the Delete key during boot to access the BIOS and change the boot order. If you have a computer using a UEFI BIOS, the steps are a little different. In this case, in Windows 10, you'll need to go to Settings > Update & recovery > Recovery under Advanced startup, click Restart now. Then in the boot menu, click Troubleshoot > Advanced Options > UEFI Firmware Settings > Restart. Your computer will then boot into its BIOS, where you can then change the boot order. Note that instructions will vary depending on your computer manufacturer. Always check your PC manufacturer's support website for details. Finally, connect the USB flash drive on the infected computer and restart. 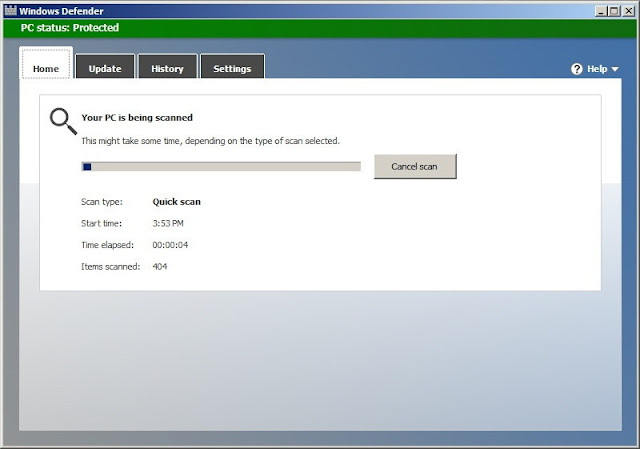 Then Windows Defender Offline will start automatically performing a full scan of any virus, rootkit, or a piece of bad software that can be recognized using the latest definition update, just like it would happen when you're running Windows. Once the scan completes, close the program, remove the USB flash drive, and your computer will automatically reboot. 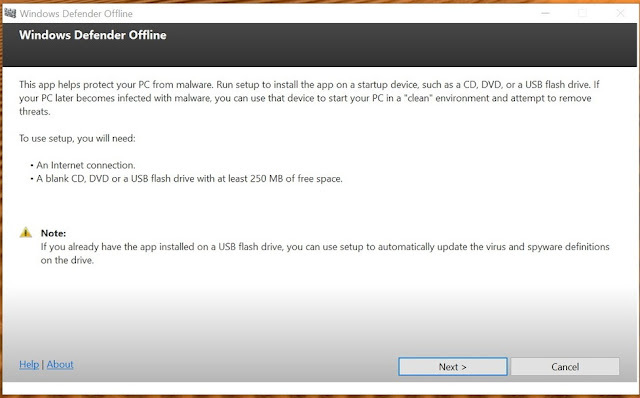 While you can create Windows Defender Offline media at any time, it's recommended that you do this at the time you need to clean an infected computer, this way you will have the latest definition update. It's important to note that Windows Defender Offline not only works with Windows 10, but you can also use this version of the antivirus on the previous version of the operating system.